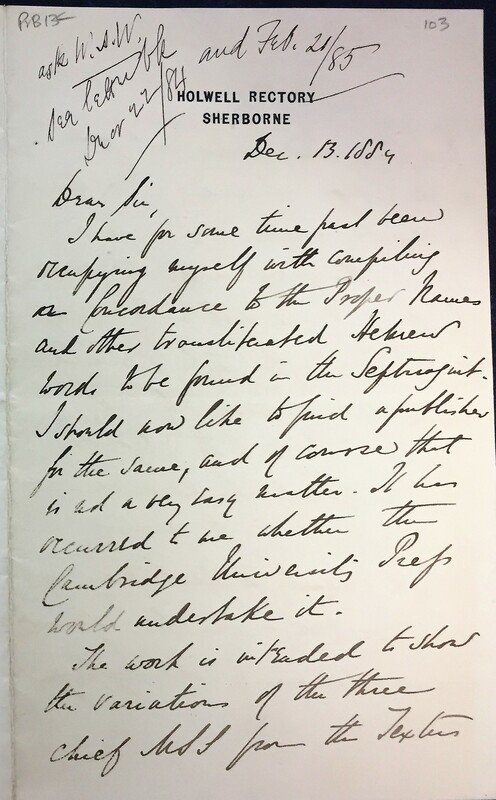 University of Cambridge | Septuaginta &c.
In two previous posts (here and here) I shared some interesting archival materials I have come across in the Cambridge University library manuscripts room. * I’ve been searching for correspondence related to some early 20th century efforts made at a lexicon of the Septuagint, so far to no avail. Yet I’ve found other interesting material. 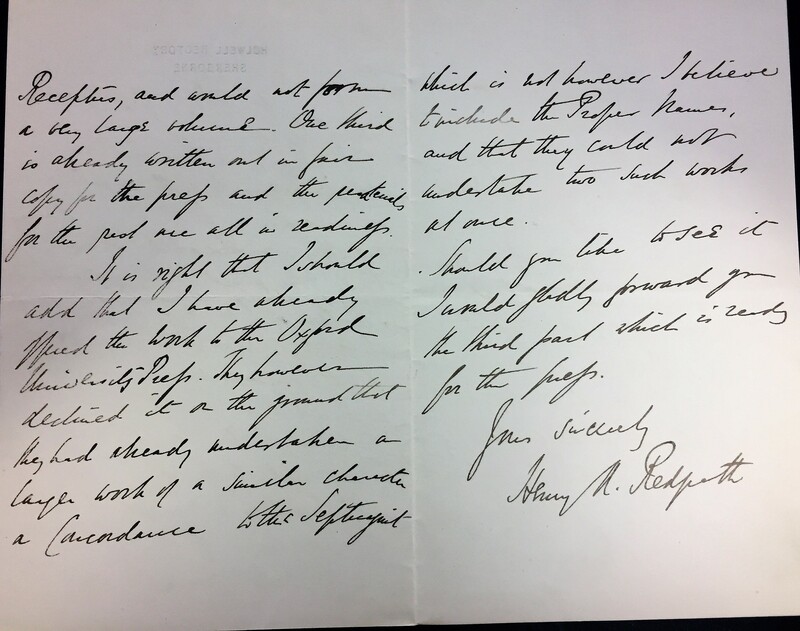 Today I post for your enjoyment a letter written by the estimable Henry Redpath (1848–1908), graduate of the University of Oxford (D.Litt. 1901), curate and later vicar near Oxford, and Grinfield lecturer on the Septuagint (1901-1905), inter alia. 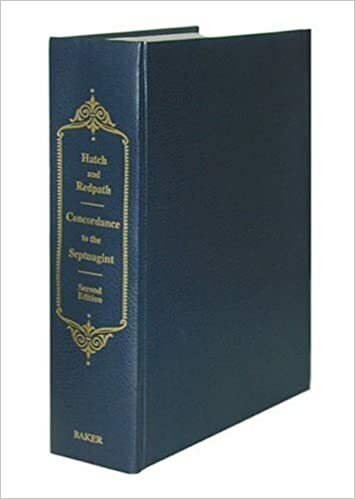 Redpath is still well-known because of his efforts to bring the concordance work of Edwin Hatch to completion, now known as simply Hatch-Redpath (second edition by Baker), but originally A Concordance to the Septuagint and other Greek Translations of the Old Testament (3 vols. ; Oxford, 1892-1906). 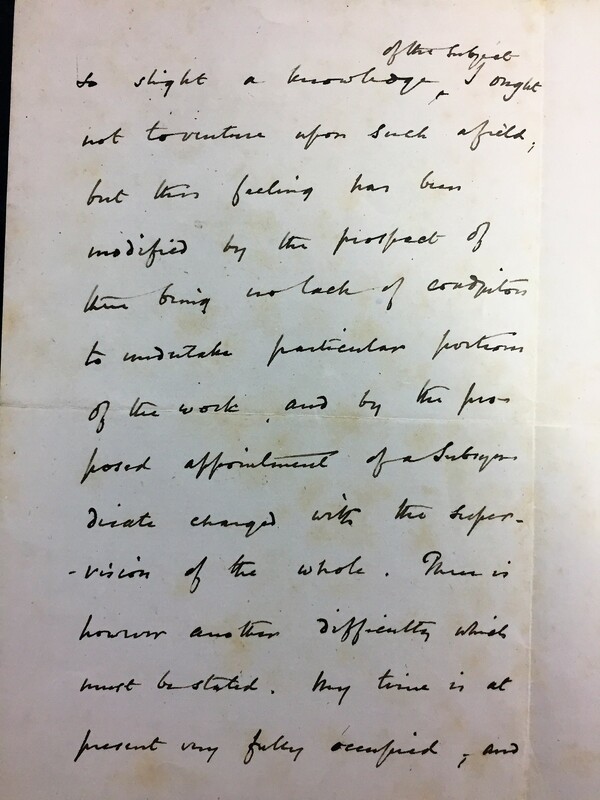 It is that work that is the topic of the letter below. As in previous posts, I have transcribed each page, with the symbol | indicating a line break. The images have been enhanced for clarity, and can be clicked on and enlarged. If you think I’ve gotten something wrong – or can decipher some of what I have left as [?] lacunae – please say so in the comments below. I have for some time past been | occupying myself with compiling | a Concordance to the Proper Names | and other transliterated Hebrew | words to be found in the Septuagint. | I should now like to find a publisher | for the same, and of course that | is not a very easy matter. It has | occurred to me whether the | Cambridge University Press | would undertake it. [p. 3] which is not however I believe | to include the Proper Names, | and that they could not | undertake two such works | at once. Should you like to see it | I would gladly forward you | the third part which is ready | for the press. In their Introductory Essay to the 1998 second edition of Hatch-Redpath, Robert Kraft and Emanuel Tov discuss the development of the Concordance in some detail. It’s worth a read. Suffice it to say that, from what I can tell, the material that Redpath pitched here to CUP ended up in Appendix 1 of Hatch-Redpath, which was revised at certain points. That appendix contains a list of LXX/OG proper names, with a smattering of other transliterated common nouns. As Kraft/Tov point out, however (p. 14), some other common noun transliterations appear also or only in the main concordance itself. * I have not looked too diligently into whether I am permitted to share these images publically. If you are someone in charge of such things and wish me to take them down, do let me know at williamross27@gmail.com. 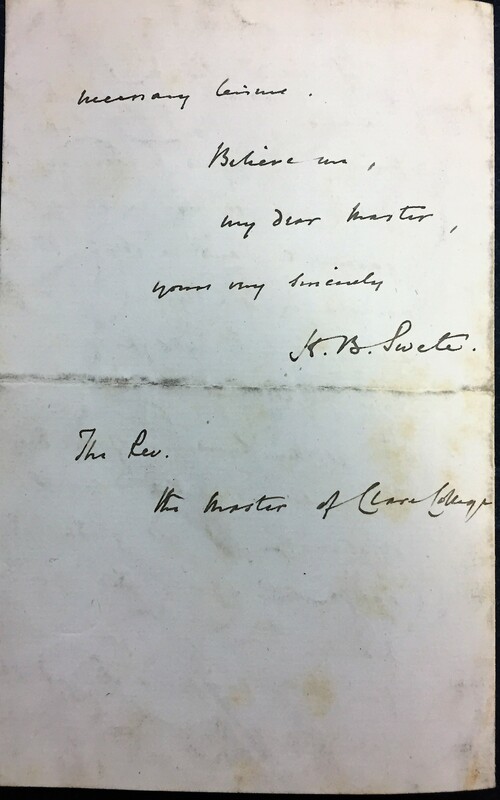 In my last post I mentioned that some of my research has taken me into the exploration of some late-19th century letter correspondence of the iconic Septuagint scholar Henry B. Swete. * The University of Cambridge Library has a special archive search system that allows you to explore the (quite extensive) collection for perusal in the manuscripts room (pictured right). This is at once a terrific resource and a real temptation, since there is an ocean of interesting things waiting to be dusted off and read. I’ve been giving in to the temptation somewhat recently as I’ve been reading through most of Swete’s mail and wandering off into interesting subjects not directly relevant to what I’m actually looking for. Oh well. 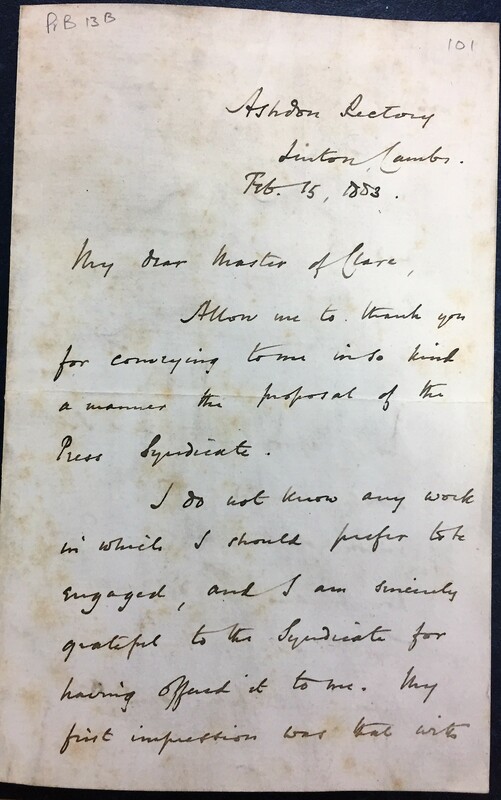 In the first post, I provided photographs and a transcription of a letter dated to 1883 from Edward Atkinson, then master of Clare and (I assume) member of the Syndics of Cambridge University Press. 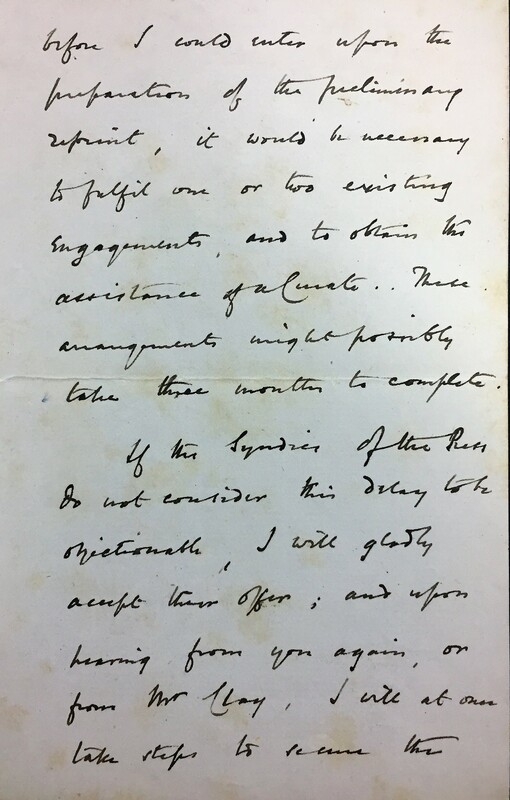 Atkinson writes to ask Swete if he is interested in taking over the editorship of a “smaller” edition of the Septuagint. As you can read below, Swete accepted – much to the benefit of the next century of scholarship – and went on to produce a critical text based on the main codices. Again, I have transcribed each page, with the symbol | indicating a line break. The images have been enhanced for clarity, and can be clicked on and enlarged. I’ve also taken the liberty to include relevant links. If you think I’ve gotten something wrong – or can decipher some of what I have left as [?] lacunae – please say so in the comments below! Allow me to thank you | for conveying to me in so kind | a manner the proposal of the | Press Syndicate. before I could enter upon the | preparation of the preliminary | imprint, it would be necessary | to fulfil one or two existing | engagements, and to obtain the | assistance of a Curate. These | arrangements might possibly | take three months to complete. It is hard not to be amused at Swete’s humility, but there is a lesson there for all of us. 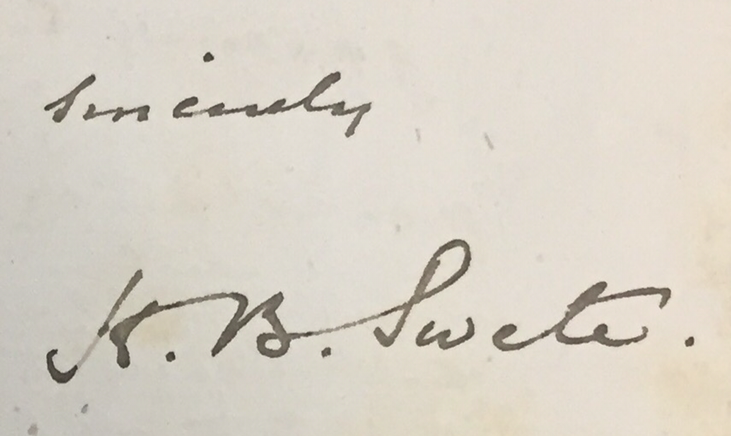 There is a boatload of Swete’s correspondence that I’m sorting through, and I will likely post more of it here in the future. Next, however I’ll be posting a letter written by a different Henry, namely Henry A. Redpath. * I will repeat that I have not looked too diligently into whether I am permitted to share these images publically. If you are someone in charge of such things and wish me to take them down, do let me know at williamross27@gmail.com.